Anxiety, worry and fear are all attacks on the mind intended to distract us from serving the Lord. The enemy also uses these torments to press our faith down, so it cannot rise up and help us in victory. The good news is that Jesus gave His peace but He said that we must not allow ourselves to be fearful, worried, unsettled, or anxious. In other words, peace is in us, but it must be chosen over what our mind thinks. We can choose to be peaceful by thinking on things that promote peace rather than worry or fear. Below are scriptures to help you promote peace rather than on things that open a door for worry, fear, and anxiety. Jesus loves me greatly and died on the cross to free me from my worries; therefore I will give all my burdens to Him. 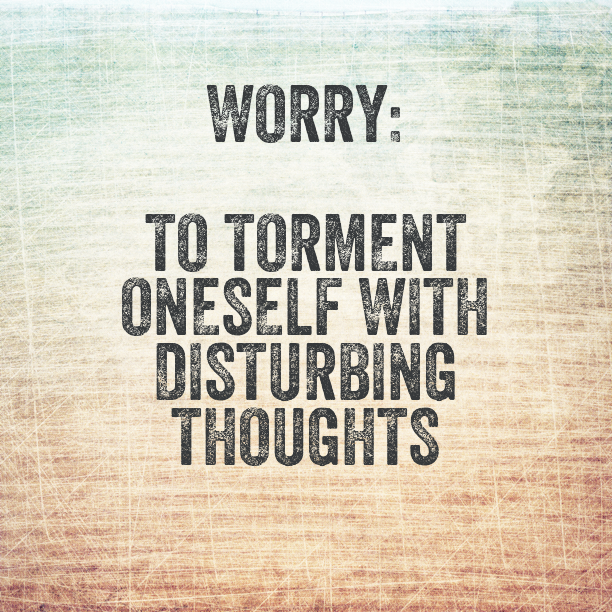 Definition of worry: Putting your faith in what the devil is saying. I came here to look for your email.. and I found this page. And I read the whole thing. I am going to read the whole thing again and again to remind myself to focus my mind on the Lord. 🙂 You’re awesome! I just sort of stumbled across your blog, and I just wanted to say thanks so much for this page! I have been allowing worry to overtake my life lately, and these verses speak directly to my heart. Today I choose faith over fear! 🙂 I have also read your story, and I am praying for you and your family!